What this script does is that it fakes graph movement. It can be seen in the example scene called 'Moving' where a character is pathfinding on top of a moving ship. The graph does not actually move in that example instead there is some 'cheating' going on. When requesting a path, we first transform the start and end positions of the path request into local space for the object we are moving on (e.g the ship in the example scene), then when we get the path back, they will still be in these local coordinates. When following the path, we will every frame transform the coordinates of the waypoints in the path to global coordinates so that we can follow them. 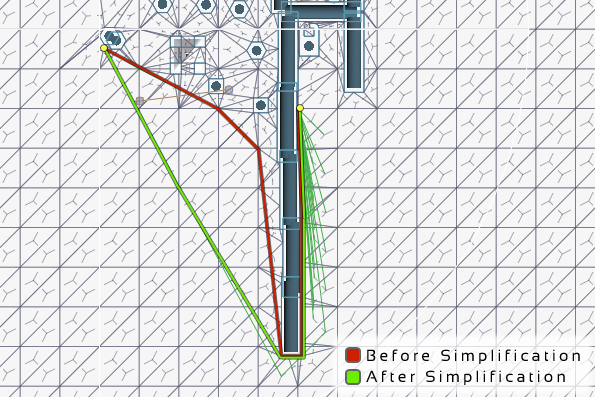 At the start of the game (when the graph is scanned) the object we are moving on should be at a valid position on the graph and you should attach the Pathfinding.LocalSpaceGraph component to it. The Pathfinding.LocalSpaceGraph component will store the position and orientation of the object right there are the start and then we can use that information to transform coordinates back to that region of the graph as if the object had not moved at all. This functionality is only implemented for the RichAI script, however it should not be hard to use the same approach for other movement scripts. Root of the object we are moving on. Max acceleration of the agent. In world units per second per second. True if approaching the last waypoint in the current part of the path. Path parts are separated by off-mesh links. True if approaching the last waypoint of all parts in the current path. Max distance to the endpoint to consider it reached. On tiled navmesh maps, but sometimes on normal ones as well, it can be good to simplify the funnel as a post-processing step to make the paths straighter. This has a moderate performance impact during frames when a path calculation is completed. The RichAI script uses its own internal funnel algorithm, so you never need to attach the FunnelModifier component. Called when the agent starts to traverse an off-mesh link. Register to this callback to handle off-mesh links in a custom way. If this event is set to null then the agent will fall back to traversing off-mesh links using a very simple linear interpolation. Search for new paths repeatedly. Max rotation speed of the agent. How long before reaching the end of the path to start to slow down. A lower value will make the agent stop more abruptly. The agent may require more time to slow down if its maximum acceleration is not high enough. If set to zero the agent will not even attempt to slow down. This can be useful if the target point is not a point you want the agent to stop at but it might for example be the player and you want the AI to slam into the player. A value of zero will behave differently from a small but non-zero value (such as 0.0001). When it is non-zero the agent will still respect its acceleration when determining if it needs to slow down, but if it is zero it will disable that check. This is useful if the destination is not a point where you want the agent to stop. When setting transform.position directly the agent will be clamped to the part of the navmesh it can reach, so it may not end up where you wanted it to. This ensures that the agent can move to any part of the navmesh. Walls within this range will be used for avoidance. Force to avoid walls with. The agent will try to steer away from walls slightly. Distance to steeringTarget in the movement plane. Declare that the AI has completely traversed the current part. Called when the component is disabled. Called when the end of the path is reached. Holds the current path that this agent is following. Fallback for traversing off-mesh links in case onTraverseOffMeshLink is not set. This will do a simple linear interpolation along the link.